It's hard to imagine that the so-called experts in the field of medicine hired by the National Football League would sign off on a report that athletes suffering head injuries on the field are not in any way seriously affected. Anyone who has ever had their “bell rung” knows that the brain is just sitting in your skull without protection. It doesn't take a medical profession to figure out the long term damage of this happening day in and day out to one's noggin is in effect a “no brainer”. Peter Landesman (Parkland) who wrote and directed this new feature based it on a GQ expose Game Brain by Jeanne Marie Laskas. The NFL management doesn't come off in a good light in this but have recently agreed to pay $765 million to settle a lawsuit brought by 4500 players alleging the NFL concealed the dangers of head traumas. And parents are now taking a closer look at their young kids on the field, as well they should. 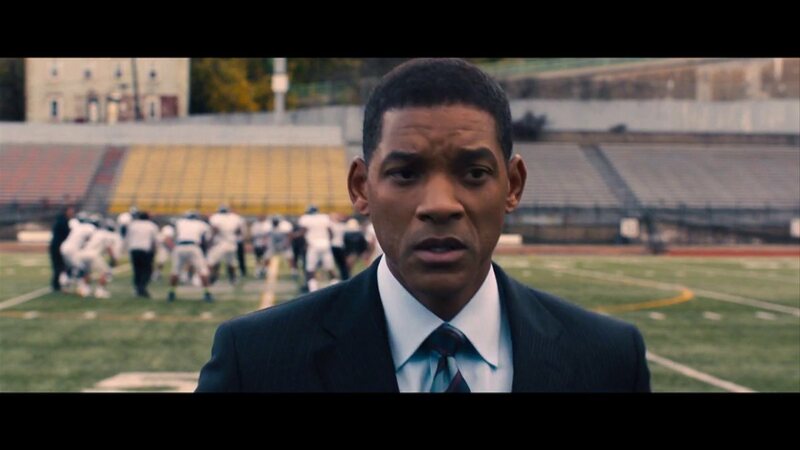 Will Smith plays Dr. Bennet Omalu, a doctor from Nigeria with 7 different degrees and probably the brightest light in the room. In 2002 he works in the Coroner's office in Pittsburgh when he was brought the body of an ex-football legend Mike Webster who had committed suicide while living in his car. Dr. Omalu finds it a mystery as to why a perfectly healthy 50 year old man would pull out his teeth then super glue them back in his head. His department head wants Omalu to leave Webster's body quickly processed as he's considered a hero in Pittsburgh, so Omalu says he will pay for the testing on his own. What he finds leads him to other cases of ex-football players going bonkers and killing themselves. The tests on their brains all show the same symptoms. His boss Dr. Wecht (Albert Brooks) supports Omalu, but begins to worry when the NFL starts taking shots on them to stop his research. Working through this medical mystery, Smith does a wonderful job of an immigrant who wants to be the best person he can be to become an American. He meets an Nigerian woman from his church, Prema Mutiso (Gugu Mbatha-Raw) who emotionally supports him through his struggles and eventually marries. Omalu publishes his findings and calls the syndrome chronic traumatic encephalopathy or CTE. He's supported by a former NFL team physician Dr. Julian Bailes (Alec Baldwin) who helps him present the information to the NFL's attempts to make it look like they are taking it seriously. It's not until three years later after Omalu is run out of town by threats to his boss and his family, that one players commits suicide donating his brain for CTE study, that Omalu work is finally justified. Will sports in general lose those brutally violent elements if more attention is paid to protecting one's head from permanent damage? Football is not the only sport what batters the brain pan. There's MMA fighting and boxing, ice hockey, soccer, skiing, and any number of activities that your head can make contact by an irreversible and deadly force. This timely movie will hopefully bring awareness as to the price these athletes endure to entertain us.